Ron Rhoads Auctioneer of Spring City, PA, held a Thanksgiving weekend auction on Saturday and Sunday, November 27-28, 2010. Much of the sale was the estate of Stanley Baker of Minneapolis, Minnesota, a noted author and collector of Railroadiana for seventy years. 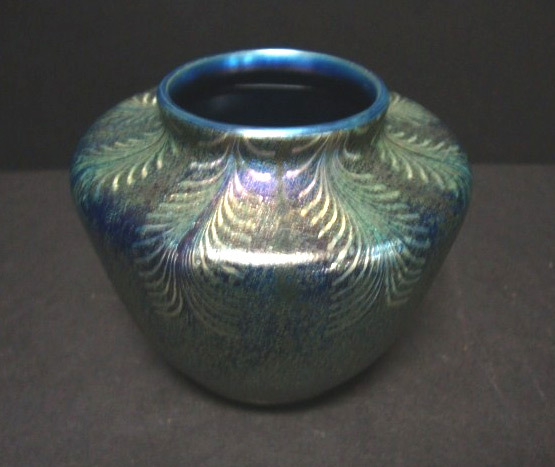 The second half of the sale, on Sunday, was mostly his wife’s collection and included some choice pieces of art glass, including a rare Lalique vase. The bidding started at $25,000, so immediately it was clear that the estimate was low. It went up in $5,000 increments, with action from four phones and five floor bidders. When it was finally over, the winner was present at the sale, and paid $115,000 + buyer’s premium of $17,250, for a total of $132,250. Everyone at the auction house was surprised, except for the bidders, who knew the rarity and value of the vase. The Hirondelles model is desirable in any color, but is rarest and most valuable in red, the holy grail. Also in the sale were a couple of very nice Tiffany Favrile vases. Lot 839 was small at 3½” tall, but very nice quality and somewhat rare. It was estimated at $800-1,200 and sold for $3,737.50, including buyer’s premium. The bidding started at $500 and quickly jumped to $3,000, with a bidder on the Internet, and ended at $3,250. St. Charles Gallery, Inc. held an auction this past Sunday, November 21, 2010. 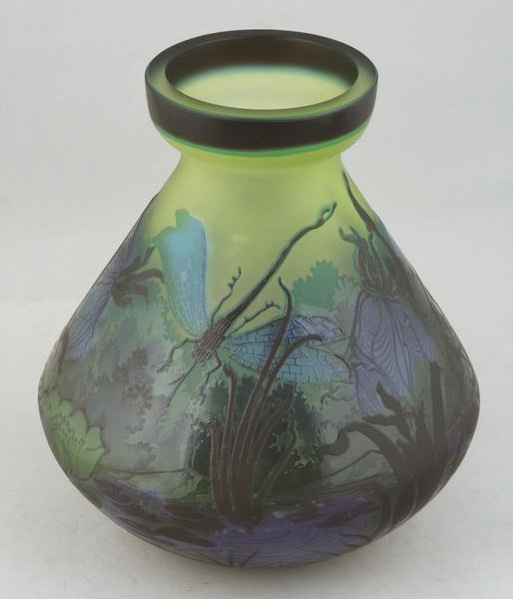 They sold two cameo glass vases that were reproductions of original Gallé vases. What was so good about that was how accurately they described them. Lot 1047 was described as follows: Tall Cameo-Cut Glass Vase, the blue over smoky topaz over yellow glass vase of tall baluster form in “Mountain Lake” decor in the manner of Emile Galle (1846-1904), the side with a pseudo-Galle signature in cameo script, h. 14-1/2″, dia. 4″. 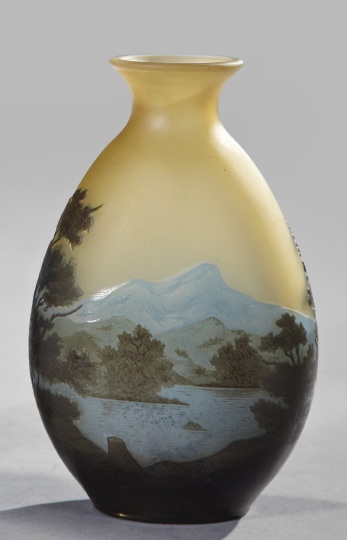 The second reproduction was also accurately described: lot 1048	Emile Galle-Style (1846-1904) Cameo-Cut Glass Vase, early 20th century, of modified flask form in “Mountain Lake” decor, signed at one side “Galle”, in wavy script within a freeform reserve, h. 8-3/4″, w. 5-1/4″, d. 3-1/2″. What is one supposed to do if the auction gallery either doesn’t know that the vases are fake or is unscrupulous and does know, and is trying to trick you? That’s the tough part. It’s important to have seen and handled enough authentic vases to be able to tell the difference. 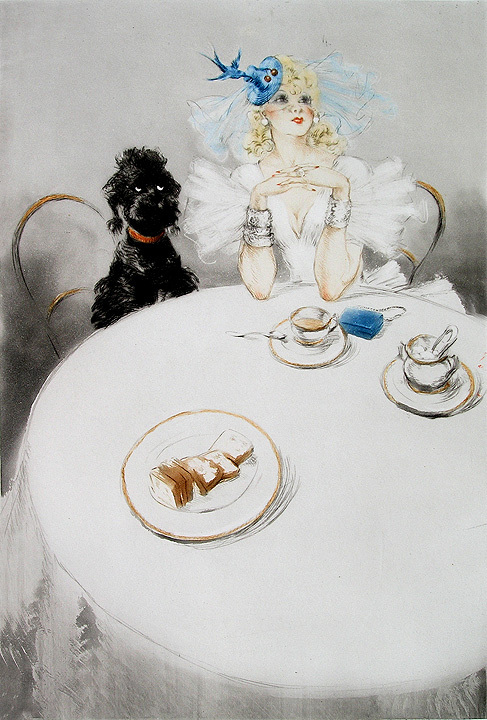 Gallé used specific colors, designs and shapes. If there are substantial differences, the odds are that it’s a reproduction. But until you’ve seen and handled many, many authentic vases, you won’t know for sure. Let’s talk specifically about the two vases at St. Charles Gallery. The first one, lot 1047, is easier to identify as a reproduction. The first giveaway is the quality of the decoration. The fisherman is cartoonish — well below the quality of an authentic vase. The second giveaway is the shape, but that’s more difficult. The foot is the wrong shape — too large and bulbous. One would only know that with lots of experience. Next is the finish. The decoration on earlier authentic vases was wheel-polished, which gave it a semi-gloss sheen, while the background remained matte. The fisherman vase has the same matte finish throughout. Again that’s difficult for a novice to tell because late authentic Gallé vases were not wheel-polished, so they were similar to the reproductions. Lot 1048 is a more faithful reproduction. The shape is a known Gallé shape. The decoration is close to authentic Gallé. The colors are close to authentic colors. This one doesn’t scream reproduction, but rather whispers it. Thank goodness this auction house didn’t try to fool anyone, because they probably would have gotten away with it. Kaminski Auctions of Beverly, Massachusetts, will be holding an auction this coming Saturday and Sunday, November 27-28, 2010. Lot 6040 is described as follows: Galle cameo vase, floral with insects, 9″ x 7 1/2″. Good condition. EST 600 ~ 900. To the best of my knowledge, Kaminski Auctions is a reputable auction house, so I can only assume they just don’t know. This one is an obvious fake, with the biggest giveaways being the dark band around the rim and the straight-cut rim. I post lessons about reproductions on my website and I continue to write about them on my blog. I’m doing my best to educate the public, but it only helps a little. Of the many appraisals I do for individuals and insurance companies, about half of them turn out to be fake. My fee for appraisals is $100 for the first object and $50 for each additional. Most appraisals are done from emailed digital images. If you like my blog, please let your friends know by sending them a link. 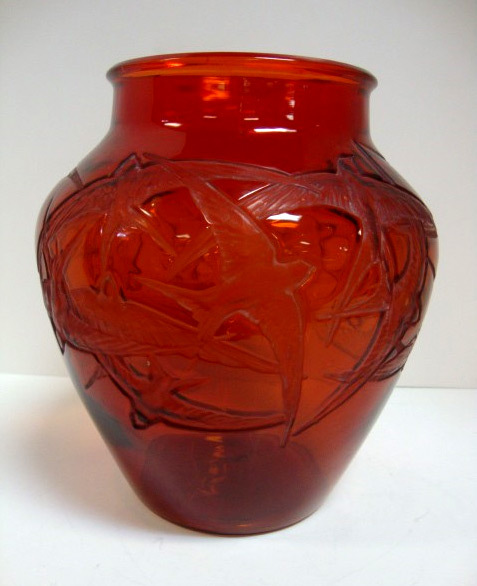 Then check out my new Daum, Gallé and R. Lalique acquisitions. I’ve listed them all on my website. I’ve listed another twenty items in the last few days, including Tiffany, Quezal, Steuben, Van Briggle, Fulper, George Ohr, Daum and Gallé. Here’s the link. 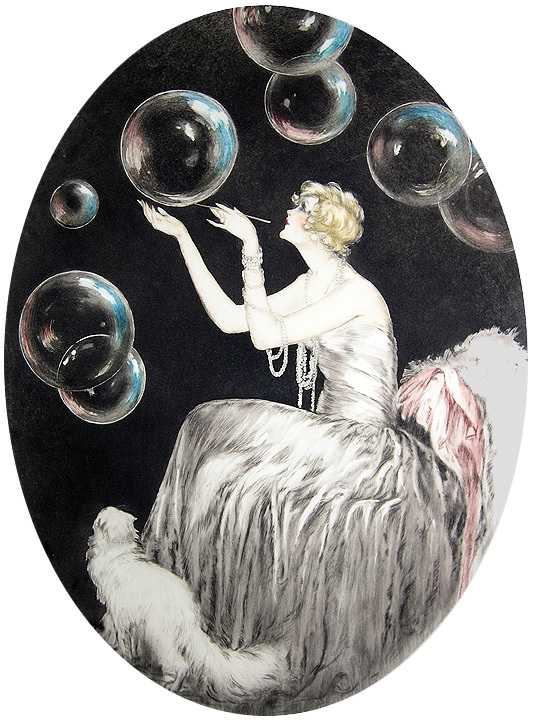 chasenantiques.com Then check out the huge sale I’m having on Icart etchings. 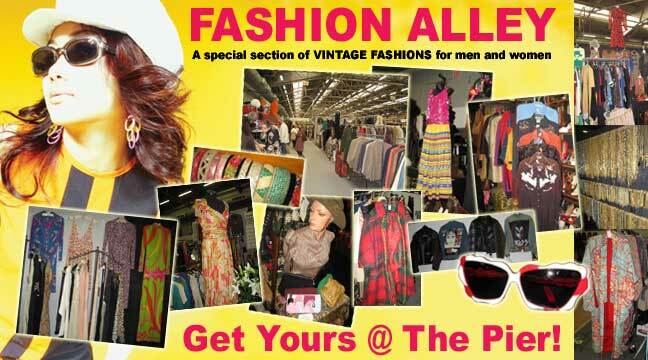 For the complete listing, click this link. Available Icart etchings. 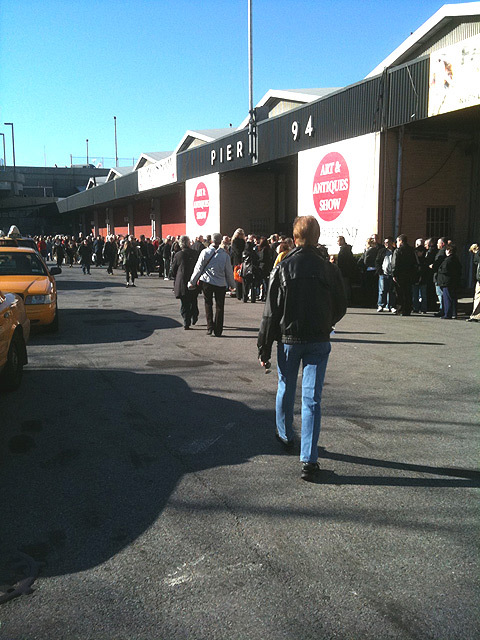 Stella Show Management held their semi-annual NYC Pier Antiques Show this past weekend, November 13-14, 2010. Attendance was excellent on Saturday and very good on Sunday. The weather was probably a factor, as it was uncharacteristically mild for a mid-November weekend. The two-pronged line extended far out of the door 15 minutes before opening at 10 AM on Saturday. 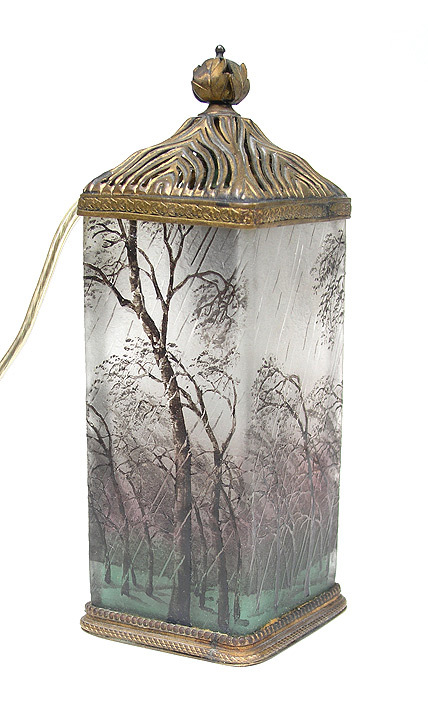 Personally, my show was good, with interest and sales in many categories, including Tiffany glass and desk pieces, French cameo glass, Vienna bronzes and Icart etchings. In asking around, I heard results from good to fair. No one was effusive and no one was glum. Most dealers were satisfied. In my last blog, I tried to convey some of the atmosphere of the show. In talking to another show promoter during the show, she referred to the Pier Show as “raw”. It made me look at the show through a stranger’s eyes. What I saw is a show that is not polished, with more functional displays than elaborate ones. That’s part of what makes the show interesting — it’s a very “New York” happening. Can I say “funky” anymore or is that passé? The hours are long, from 10 AM – 6 PM, both Saturday and Sunday. It makes a lot of sense on Saturday, when there are lots of people all day, but it makes NO sense on Sunday. The hours should be 12 – 5 PM, but I can understand longer hours. At the very least, the hours should be shortened one hour on Sunday, from 11 AM – 6 PM. I spoke personally to Irene Stella about the change, but she indicated to me that the dealers needed the extra hour to park in the street and pay their bills. Excuse me??? I need an extra hour’s sleep and rest and not help with parking or paying my bills. To those other dealers who read my blog, please let Irene know you agree with me. From 10 – 11 AM, I did not answer a single question from even one person, nor did I open a single cabinet. The show didn’t even start to fill up until about 11:30 AM. Irene, please change the hours. OK, enough of my bitching. Stella Show Management continues to put together high quality full shows in a world where many shows are shrinking dramatically. Their publicity is good, so they maintain consistently strong attendance. I wish them continued success. Twice a year, Stella Show Management holds the NYC Pier Antiques Show at Pier 94 on New York City’s Hudson River and 56th St. Everyone I know looks forward to this show because New York City doesn’t have another one like it. 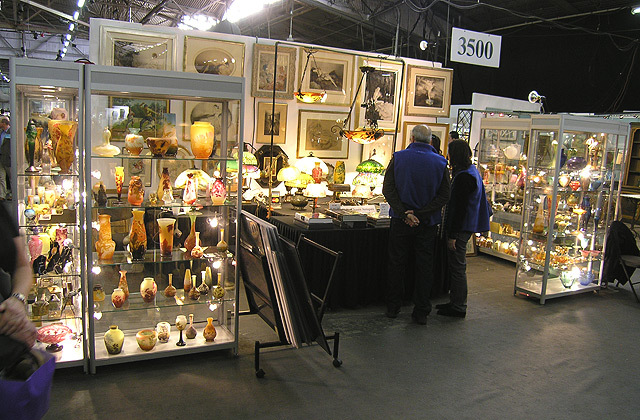 Of course, there are plenty of shows in NYC, especially fancy ones at the Armory on Park Ave. and 67th St., but the Pier Antiques Show is one-of-a-kind. The only show that was similar is no longer in existence. It was a show in the Exposition Rotunda of Madison Square Garden on 8th Avenue and 31st St. The attendance and enthusiasm for that show were tremendous. What makes this show different is the huge diversity, from vintage clothing and costume jewelry to unique decorator objects to autographs (think George Washington!) to high-end items (think me, among many others). Anticipation and enthusiasm run high for the show. Some of the first people through the door are a bevy of decorators. I can’t think of another show with as many decorators. 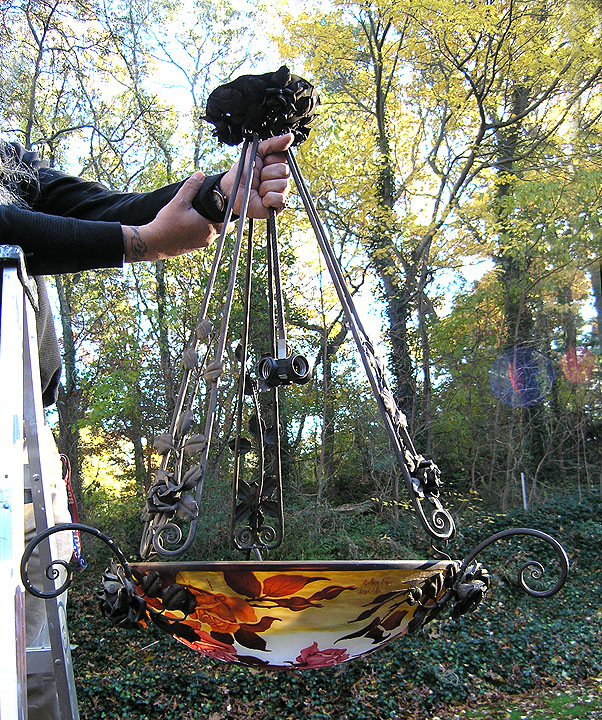 They rush in and snap up the unusual items that decorators know how to place. Also in the initial rush are many dealers and collectors (including some from Europe and Japan), all looking to find that special object or objects. And they are usually successful. You can tell by the line of people waiting for taxis. More than half of them will be carrying packages. That’s an unusually high percentage of buyers. You can always tell how a show is going by the number of people carrying packages. If attendance is good, but there are few packages, the show is not going well for the dealers. I’m bringing some really special items to this show. One of them is a great French cameo chandelier by Muller. One of Muller’s best subject matter is roses and this beauty is covered with them. What else? Well, I was in a house in Chicago and got some wonderful items you wouldn’t normally expect to see in my booth, including a large Satsuma decorated bowl in the shape of a nautilus shell with underwater decoration on one side, a beautiful English tea caddy, a Vienna bronze basket with a bird, etc. From another collection, I’m bringing some very fine Daum Nancy acid-etched and enameled vases that haven’t been seen before. Then there’s two KPM plaques of pretty girls, a couple of Quezal vases, and lots of new items that haven’t seen the light of day in many years. The show runs only two days, so the action happens fast. It opens at 10 AM on Saturday and closes at 6 PM, with the same hours on Sunday. Most show promoters feel they need at least three days for exhibitors, but I beg to differ. A compact show creates excitement. There are more people walking around when items start to sell. That forces people to make up their minds faster and that generates electricity. Shows need electricity, not dripping water torture. Maybe it’s the wrong approach for the Midwest, but it certainly works in NYC. If you haven’t yet made your plans to come, do it now. There are plenty of parking lots in the area plus taxis and public transportation. As long as you’re in the city, go to one of the great restaurants or museums. There’s lots to do and enjoy over a weekend in New York City. Today, November 4, 2010, Sotheby’s held their 19th Century European Art sale with decent results that included one sensational one. Two of the lots belonged to the actress Demi Moore. 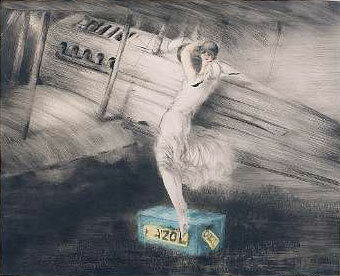 She had purchased them at a Christie’s auction in 1995 and consigned them for sale at this Sotheby’s auction. The first was a lovely painting of a sister and brother by William Bouguereau, for which Moore had paid $178,500. It sold below the estimate of $1,000,000-1,500,000, but totaled $1,082,500, after including the buyer’s premium. The buyer’s premium belongs to the auction house, so Moore will likely receive a figure in the $850,000-$900,000 range, after seller’s fees are deducted. Not a bad payday after 15 years, but below the hoped for price within or above the estimate. 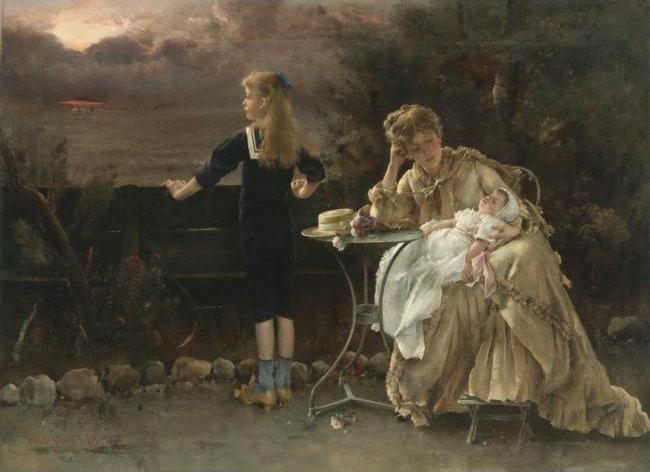 Her second painting, by Alfred Stevens, did not fare as well. Moore paid $200,500 in 1995. The painting sold for $182,500, including buyer’s premium, so Moore is likely to receive a figure in the $135,000-$150,000 price range, after seller’s fees are deducted. Taken together, her investment of $379,000 in 1995 will return approximately $1,017,500. Most people would be very satisfied with that kind of return. Anything can happen at auction, good or bad, but the good results generally make the news. 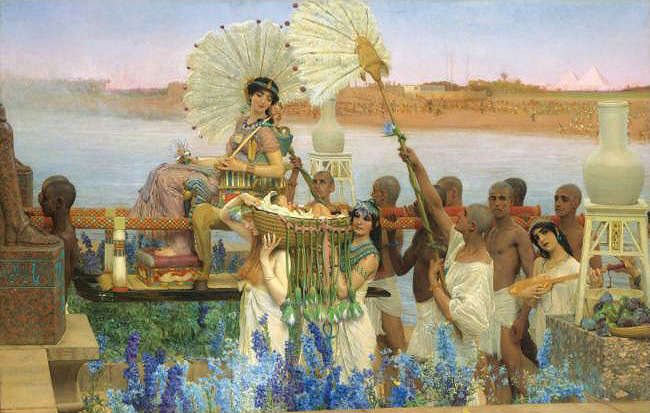 A huge, 53¾” by 84″ painting by Sir Lawrence Alma-Tadema, estimated to sell for $3-5,000,000, brought the astounding price of $35,922,500, including buyer’s premium. A result like that is the same as winning the lottery — it doesn’t happen very often, but when it does, it makes for one happy winner. For the complete results of the sale, click on the following link, Sotheby’s 19th Century European Art sale. Dimensions: ht. 4 1/4in., dia. 6 1/4in. In their written description, they left out the fact that the inkwell rotates — a rare feature, however they did mention it just before selling the object. The bidding started at $15,000 and continued in $1,000 increments until the final price of $30,000 ($37,500 with the buyer’s premium). In my opinion, the price was a bargain if the buyer was a collector and a bit high if the buyer was a dealer. 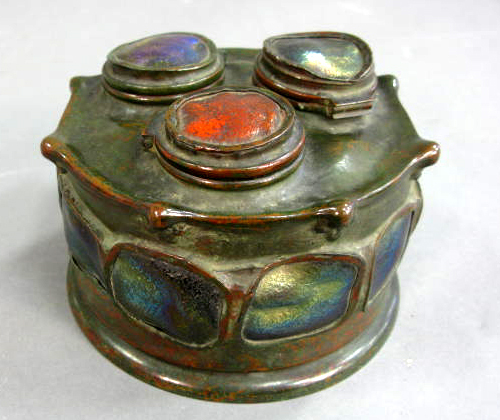 I had guessed the final price would be closer to $50,000, considering the beauty, rarity, and desirability of this very fine inkwell. 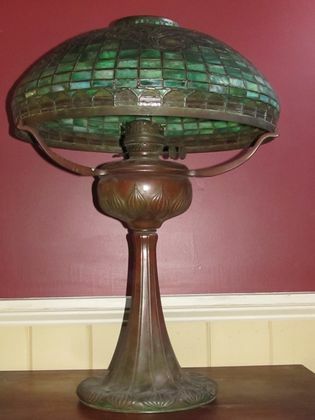 On the same day, Gaudreau’s Auction Company of Killingly, Connecticut, sold a Tiffany Studios Tyler Scroll table lamp, in as-found condition. The lamp had an original kerosene burner and a very dirty shade. It had never been electrified. The unreserved lamp was sold at the high end of the $10,000 – $20,000 pre-sale “guesstimate” for $20,000 ($22,000 with the buyer’s premium) — a very fair price for the lucky buyer, followed by loud applause from the audience. The lamp was not pictured in any advertisement, only described. One had to visit the auction site to see photos of it. I don’t think any sweeping conclusions can be drawn from these two results, except to say that if you had enough spare change and the knowledge of when and where they were selling, you could have bought two winners.